Recently home server Amahi based on Fedora Linux added two new applications to its repository – Videos5 and Gallery 3. Videos5 allows you to stream video to the iPhone, iPad and iPod, Android devices and many others which support HTML5. Additionally it offers possibility to transcode streamed media. But that feature isn’t implemented yet in Videos5 application. Gallery 2 was one of the most popular Amahi application. It gives an easy and intuitive way to organize photos on the web site or local network. The Gallery 3 is the next version of that popular tool. So, Amahi team hopes it’ll be also popular. The popular online video service Hulu was integrated into LinuxMCE 0810 beta. That integration uses recently released Hulu Desktop for Linux. User has full control over Hulu player from both LinuxMCE UI1 and UI2. On-screen UI2 Orbiter uses native Hulu player functions to navigate on media library and control playback. But the rest Orbiters provide that functionality via their remote control screens. The Hulu integration into LinuxMCE is good but unfortunately it can be used for US only. From another hand it may give the idea for developers how to integrate the rest famous video/audio services such YouTube, JustinTV, Revision3 etc. The video demonstrated that functionality is available below. ATI Catalyst 9.1 is out! Additionally it was improved support of ATI Radeon HD 3200 – video adaptor which gives a lot of troubles for LinuxMCE users. So, try that newest drivers. Maybe they will solve your problems. Support of CPU 9XXX and some 8XXX and 7XXX. Added initial support for PureVideo-like features via the new VDPAU API (see the vdpau.h header file installed with the driver). The VDPAU API is already implemented in the mplayer, libxine, ffmpeg, vlc and MythTV. A bunch of bugs found in the previous version of the drives was fixed. The nVidia 180.22 video drivers are available for Linux (IA32, AMD64/EM64T), Solaris and FreeBSD. Good news for all movies fans who own Windows Media Center. Now you can watch more than 3400 selections of movies, TV shows and music videos on your media center thanks for offered extender. 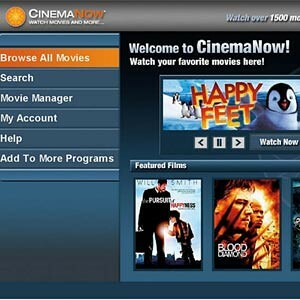 Once you install the CinemaNow extender you’ll able to watch selected movie or TV show (pay-per-view), download it to your media center (download-to-own) or get legal DVD copy (burn-to-DVD). The price is very reasonable. So, you need just a high speed Internet connection which is not something unreal today.